Expert representation from Business Advisors who are committed to standing up to employers on your behalf. You are part of a multi-cultural, multi-industry union with a vast collective knowledge and expertise. We are known all over Alberta for being staunch supporters of workers and their rights who don’t give up. 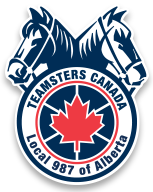 In tough economic times, having a strong union like Teamsters Union 987 on your side is priceless. We are relentless on your behalf, protecting your job so that you can continue to provide for your family. On average, a full-time union worker in Alberta earns $4.88/hr more than a non-union worker. by an expert legal team! In the face of legal battles with big corporations, take comfort in knowing that Teamsters Union 987 will go to bat for you – and the lawyer fees are covered. As part of the union, your shifts, overtime, vacation and sick leave are all clearly guaranteed through your collective agreement. to fair treatment! Members can always contact their shop steward or business agent for support in filing grievances. Teamsters Union 987 to negotiate for you! Our six full-time Business Agents are skilled and experienced in getting the best collective bargaining deals for members. We are proud to be Teamsters!